Empty, symbolic gestures is how you do bad performance art; it’s not how you educate children. Camp Solomon Schechter, one of the Pacific Northwest’s longest-serving and best-loved Jewish summer camps, caused a bit of a stir this weekend after it hosted a group of 14 children, including Christian and Muslim Palestinians, and flew the Palestinian flag in their honor. 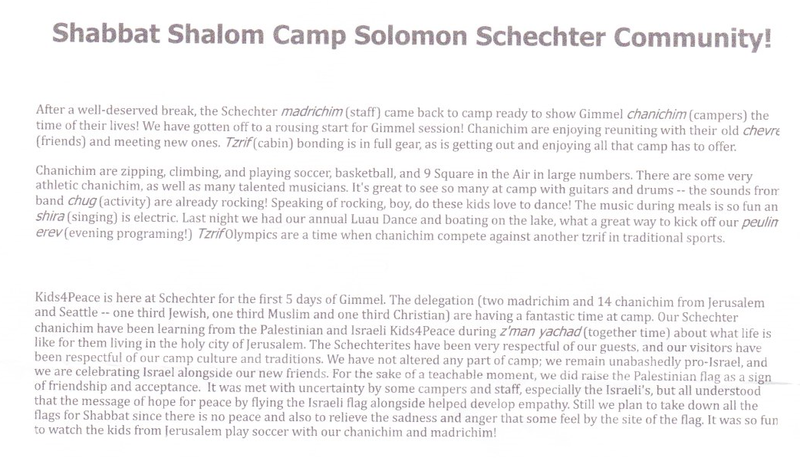 This upset some campers, parents, and alumni, who wailed that the black-white-green-and-red had no place among the blue-and-white, and that a camp committed to Zionism and Israel shouldn’t kowtow to the enemy. Those outraged—and I say this as an uncompromising supporter of Israel’s right to defend itself against Palestinian terrorism and incitement—are missing the point. The problem here isn’t that the camp chose to welcome its Palestinian guests by flying their colors; that alone is a sweet gesture, especially when the Palestinians in question are prepubescents, not armed members of the Tanzim. The problem is that the camp chose to address the Israeli-Palestinian conflict in a mindless, morally preening way, treating it not as something concrete but as a collection of grand symbolic gestures. Ignore, if you can, the writer’s tenuous grasp on grammar, or the jarring shifts in tone between talk of sadness and anger and peppy reports of a spirited soccer game. But consider the logic at play here: we flew the flag because we hope for peace, then we took it down because there is no peace, and also because some people were upset. You hardly have to be a great educator to realize just how profoundly idiotic this sentiment truly is, and how likely it is to raise a generation of children who are thoroughly confused. First, it reduces a thorny issue with real complexities and uncomfortable truths to one easy empty gesture. Why bother with facts and figures and nuance when you can just wave a piece of colorful cloth? And then, rather than use this gesture responsibly and invite the campers and staffers to talk about why the flag makes them uncomfortable—maybe, say, because the authority it represents spends a considerable portion of its budget promoting and rewarding the systemic murder of Jews—the camp opted to double down on the symbolism and take the flag down as a way to bemoan the elusiveness of peace. This is how you do bad performance art; it’s not how you educate children. What might a camper learn about the conflict from such an obtuse display? Nothing real. If you’ve graduated from Schechter school of symbolic semaphore, you may be forgiven for believing that if only both sides showed some goodwill and played some soccer and waved some banners, peace on earth would soon prevail. Which, sadly, is what most American Jewish children are taught about the conflict, and which is why so many get to college and eagerly join fringe anti-Israeli groups. If you’re brought up on empty gestures, you’re going to naturally gravitate to the emptiest gestures you can find as you grow up. I believe that in this piece, Liel Leibovitz is both insightful and presumptuously misguided. He is insightful insofar as he recognizes–unlike most of those having a fit about this event–that the real issue is not the raising of the Palestinian flag in order to honor a visiting group of kids. That is a symbolic gesture, and while symbolic gestures carry weight, it’s not the heart of the matter. The crux is the visit itself, the actual exchange of words and deeds and opinions and culture between Jewish, Muslim, and Christians, Jews and Palestinians, at a Zionist Jewish summer camp. Here’s where Liel is presumptuous and misguided, because he criticizes the content of the exchange to be vacuous and confusing (“why bother with facts and figures and nuance when you can just wave a colorful piece of cloth?). Doesn’t sound vacuous, or like a betrayal of Israel or Zionism to me–more like an embrace of what I believe our Jewish state and community embody at our best. Schechter and Kids 4 Peace are all about moving beyond fear, about acting on our hopes and dreams rather than our insecurities.